I went to Porto again today. When I visited last week, I concentrated on walking around and getting a feel for the city. When I went back earlier today I wanted to take a ride on the funicular. I also had high hopes of travelling in a cable car for the first time. I got as far as the entrance of the cable car building, thought about how high it was, worried about the strength of the cables, and bottled out. Yep! When it comes to heights, I’m a sissy and I know it. I did ride the funicular though. It would have made more sense to ride the funicular up the hill. Walking up hills is the hard part, coming down them is easy. I chose to do things the other way around because I thought the view going down towards the river would be more interesting than the one going up the hill. I made a wise decision. It was quite an experience, slowly descending and watching the traffic on the road and the boats cruising along the river. The only other time I’ve travelled on a funicular was at Saltburn. The journey was shorter and the hill was not as steep. 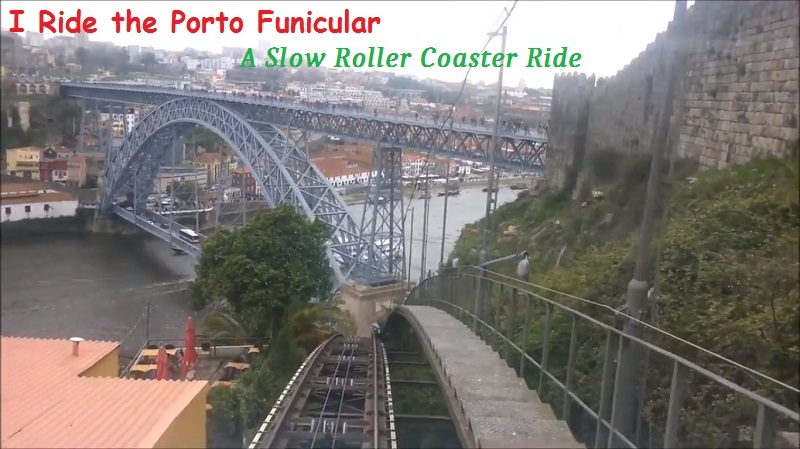 The Porto funicular ride was very different experience. The journey down begins in a tunnel. When the cab emerges from the tunnel, there is a passing spot for it to manoeuvre around the cab that’s on the way up the hill. The two cabs share the same cable and counterbalance each other. The funicular at Saltburn is different because each cab has its own track. 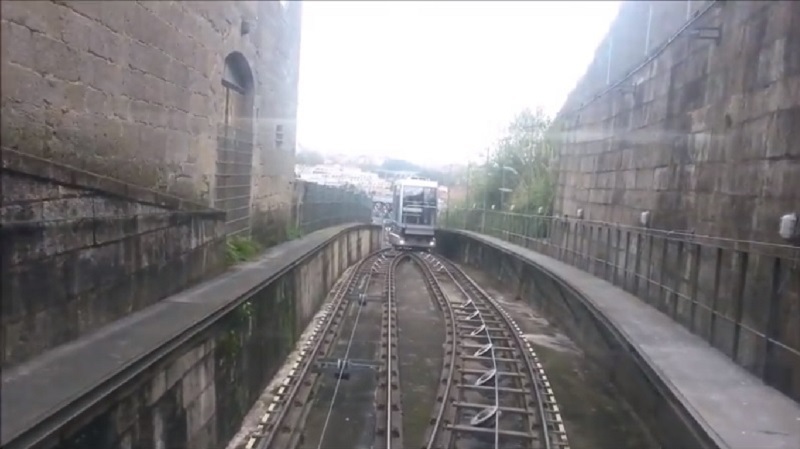 The Porto funicular has only one track that briefly becomes two tracks at the passing spot. It’s a nifty piece of engineering. Another difference between the Porto funicular and the one at Saltburn is thereos a sudden drop. Shortly after the two cabs pass, the track ahead starts to disappear from view and, as the cab approaches the drop, it’s a little like taking a slow roller coaster ride. One lady stopped her conversation to exclaim, “Oh, my god!” I think the journey in the other direction must be boring in comparison. Perhaps I should try that sometime and see. A one-way journey on the Porto funicular only costs €2.50. That’s pretty reasonable for a slow roller coaster ride.